Two different gem materials can correctly be called jade. Jadeite is one of them, and the other is nephrite. Both are actually metamorphic rocks made up of tiny interlocking mineral crystals. These interlocking crystals make both gems exceptionally tough. Jadeite comes in a wide range of attractive colors: Many shades of green, yellow, and reddish orange, plus white, gray, black, brown, and lavender (often a light purple or light grayish violet color). The coloration is often streaked or mottled, giving jadeite gemstones an interesting visual texture that carvers can use to create imaginative and intriguing effects. Nephrite is also accepted as jade in the international gem and jewelry industry. It ranges from translucent to opaque and can be light to dark green, yellow, brown, black, gray, or white. Its colors tend to be more muted than jadeite’s, and they’re often mottled or streaked. 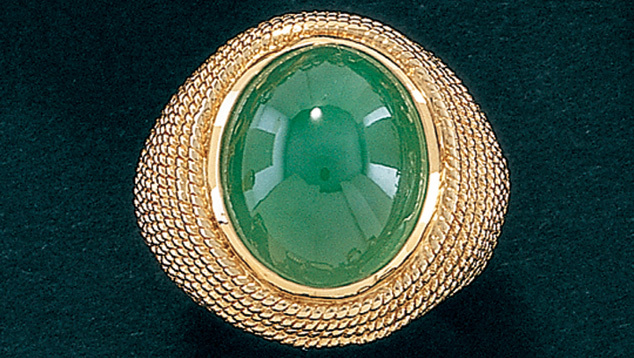 Modern gemologists use the word “jade” as a generic term for both nephrite and jadeite. These gems have been linked throughout history. In fact, the term jade has also been applied to a number of gems and ornamental materials that resemble jade, and even some manmade equivalents resembling jadeite and nephrite. Rough jadeite jade often takes the form of boulders. This one from Myanmar weighs 23 metric tons.